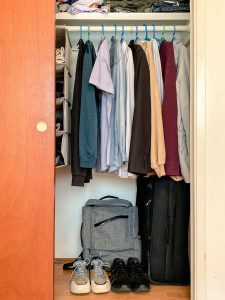 Living in a place without a lot of space for your clothes is a nightmare. Luckily Clothy Krueger won’t be coming for you. How is that possible, you ask? Here’s some clothing storage guidelines to help you to win your ongoing space war. If you have a large collection of tops, T-shirts, sweatpants, and capri pants, try rolling them up like you’re rolling up the dough in a sausage roll. You may be surprised when you see the amount of space you can save. Whether it be in your suitcase or in your chest of drawers, rolling can be a game-changer. I suggest only rolling up clothes that can quickly recover from wrinkles. Ah yes, the pesky wrinkles that are often present when some clothes aren’t ironed or placed properly on a hanger. Garments made from looser fabrics like jersey will be ideal—while linen might suffer some consequences. Be wary about rolling up your white, crisp top for your job or your job interviews. Take extra care as well to avoid rolling up your light grey or white workpants with the vertical crease that runs down the front of the pants. Rolling can ruin pleats or pleated seams. Instead of just dropping your socks in your dresser or suitcase, try pairing them up. Not only will this practice save you time when you are looking for socks, this method is also a good way to help you to find some more room. If you like colour coordination, you can also roll up your socks with the same colour towards one side of your suitcase or your drawer. Remember the scene from The Middle when Frankie placed multiple layers of clothing on her body? Thankfully, you don’t have to be a human hanger. You can hang several tops on one clothes hanger by first hanging up a few tops that you can put over your neck—and then placing tops that can be buttoned or zipped over the pullover tops. Depending on the size and style of your tops, you may be able to place five or more tops on one plastic hanger. However, be mindful about hanging too many tops on one hanger—as there is a possibility that the hanger might break or bend. Now that you’ve found some more space for your clothes, you’ll be ready to open your suitcase or your drawer with a smile to show that you’re a clothing storage champion.